Please Report Me If I Am Missing. Thank You. As you can see, the notice tells the reader that the notice the reader is reading is legally required to appear on all vending machines. That includes the machine on which the notice is posted, which is fine, because there it is. But if, the notice continues, it does not appear on that machine, then the person not reading it should report it not being there, using the phone number it would otherwise be providing. In fact, the notice emphatically states that the number provided is not to be used for any purpose other than reporting its own absence. I guess the good news is that, if you manage to comply with this, you might get a reward. This is the result of HB 7157, a general tax bill that included just this one provision on vending machines. 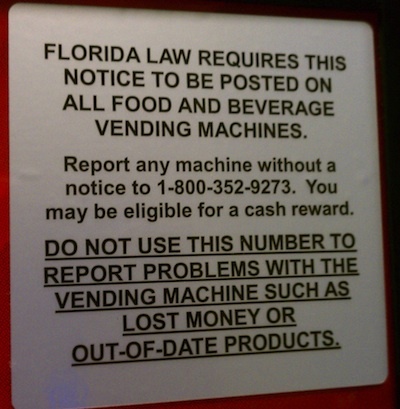 An existing law required vending-machine operators to register with the state department of revenue and to attach a notice to each machine stating the operator's name, address, and federal employer ID number. Fla. Stat. § 212.0515(3)(a). According to this article in Vending Times, an item I somehow missed although Vending Times is the first thing I turn to every morning, this was mostly helpful to identity thieves who could just go around writing down this handy information. The bill was apparently intended to put a stop to that by requiring new labels that included only the language shown above. But with only the "please report me missing" language remaining, the notice looks especially pointless. My guess is that the notice is supposed to serve as evidence that a particular machine has been registered; if it's missing, competitors could easily see that and report the unregistered competing machine. Presumably, they would know the number to call even if the notice is not there to tell them. But that still doesn't explain why the notice reads the way it does – the state could just provide a smaller license sticker, like it does with cars, and then just give the reporting information to operators or whoever they think is likely to call this in. So it's still hard to see why we have this notice getting all uppity about it being legally required, and giving out instructions that you either (1) don't need or (2) do need but can't follow because it's not there to tell you what to do. I think I'll make myself a T-shirt that reads, "IF I AM MISSING PLEASE CALL ________," giving my own phone number. And then call myself to see if I disappear. DWI Lawyer Marketing Fail or Marketing Genius?